Copyright © 2013 Samuel L. Baker. The data are produced by the Centers for Medicare and Medicaid Services (CMS), part of the U.S. Department of Health and Human Services. CMS's main responsibility is to manage Medicare, the Federal program for financing health care for the elderly and disabled, and the Federal portion of Medicaid, the Federal-State program for financing health care for some of the poor, as well as the related SCHIP program. Medicare and Medicaid spent about $974 billion in 2011, which was about one-third of all U.S. health care spending. CMS's web site, http://www.cms.hhs.gov/NationalHealthExpendData/, has current and historical data on the U.S. health care system. In this chart, the green triangles show the percentage of the gross national product going to health expenditure. Use the green percentage numbers on the right axis. 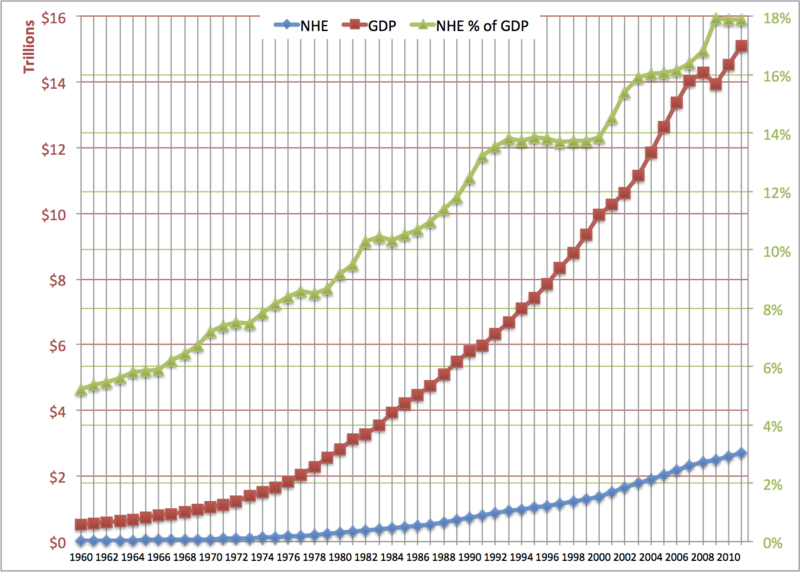 The red squares, for gross domestic product (GDP), and the blue diamonds, for national health expenditure (NHE), are measured by the red numbers on the left axis. Looking at the rightmost column of the chart, U.S. national health spending in 2011 was $2.7 trillion (blue diamond). This was 17.9% (green triangle) of the U.S. Gross Domestic Product in 2011, which was $15 trillion (red square). In 2011, more than one dollar in six that was spent on anything in the U.S. (that is what the GDP is), was spent on our health care system. Divide the $2.7 trillion national health spending in 2011 by the U.S. population in 2011 -- about 311 million -- and you get an average of $8684 per person spent on producing health care. Back in 1960, it was only $147 per person. As the chart shows, the GDP and national health spending have risen a lot over the last 51 years. National health spending has grown faster than the whole economy, which is why the green line goes up. The left end of the green line is at about 5%. Back in 1960, health care was 5.1% of the GDP. That percentage rose rapidly from 1960 to the early 1980s, as private and public health insurance expanded. There was a brief pause during President Reagan's first term, when Medicare started rewarding hospitals for discharging patients sooner. A longer pause in the growth of the percentage was when Clinton was President, and private health insurance switched to managed care. In the early years of the Bush II Administration, the percentage of health care in the GDP rose rapidly, but then it almost levelled off. In 2009, the economy shrank while health care spending grew, so the NHE in GDP percentage jumped up. From 2009 to 2011, GDP rose at just about the same rate as national health expenditures, as Obama's stimulus gave us a partial recovery from the worst of the depression. The red and blue lines are both steeper in the left half of the graph than in the right half. 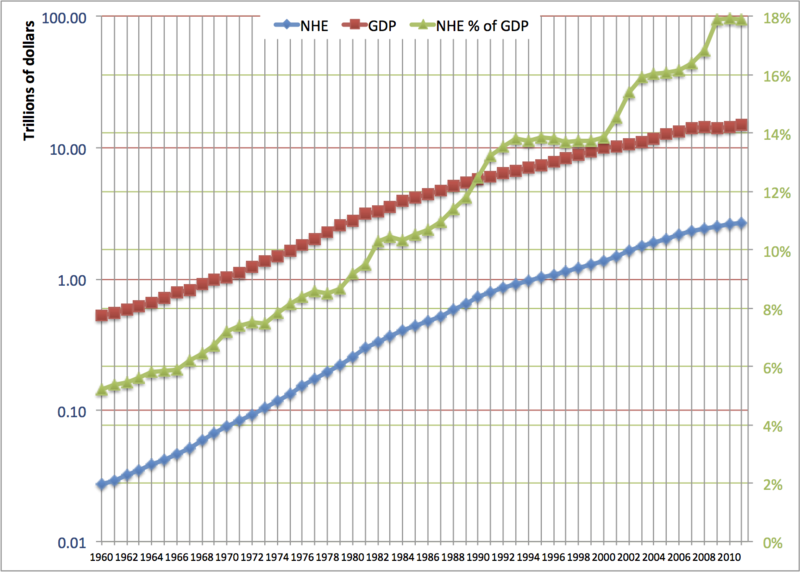 This means that NHE and GDP grew at a slower rate after about 1980 than they did before 1980. The blue line is steeper than the red line. This shows that national health expendiure's growth was faster than the growth of the whole economy over the whole period. When the blue line is steeper than the red line, the green line goes up. That was so most years, but it was not so in the 1990s and since 2009. In years for which the green line is pretty level, national health spending grew at the same rate as the whole economy. This graph shows the year-to-year growth rates of national health spending (NHE) and total economy spending (GDP), as well as the percentage of GDP going to NHE. The blue triangles show by what percentage national health expenditures grew each year from the year before. The purple diamonds show by what percentage gross domestic product grew each year from the year before. 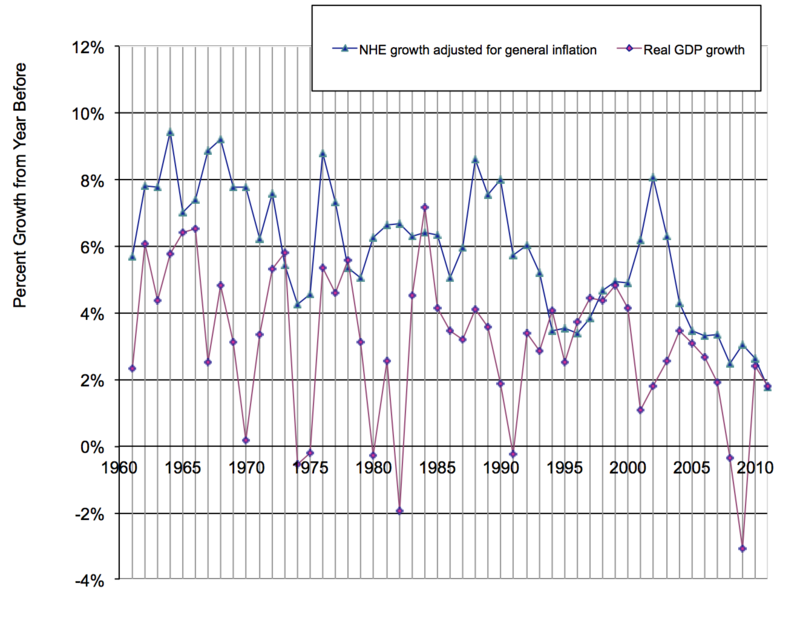 For example, the purple diamond on the 1961 line indicates that GDP in 1961 was about 4% more than GDP in 1960. The green line is just like in the graphs above. It shows the percentage of the GDP going to the health care system. It's scale is on the right. Most years, the blue triangle for national health spending is above the purple diamond for GDP, indicating that health care spending rose faster than GDP in those years. It used to be that the exceptions were years when the economy was recovering from a recession. For the past couple of years, the growth rate of national health spending has been at its lowest in a long time, probably since the 1930s. The economy has been growing rather slowly by historic standards, but it's been fast enough to keep up with health care spending. The previous time when the economy grew as fast as national health spending was during the Clinton administration, from 1993 to 2000. During 2001-2003, the economy (red line) grew more slowly while health spending (blue line) grew faster. From 2003 to 2007, national health spending and the economy grew at close the same rates again. Then, in 2008, the economy's growth rate plunged, and in 2009, the GDP growth rate was negative. The percentage of the GDP going to health care shot up, even though health care spending's growth was only 4%. In 2010 and 2011, the GDP grew about 4%, closely matching health care spending's growth rate. The GDP's line in this graph has bigger jumps up and down than health care spending's line. Health care's growth rate did not plunge when the economy tanked. In economics jargon, health care is generally less "cyclical" than the whole economy. More on this later. There is a problem with using the GDP to measure economic growth and with NHE to measure how much health care goods and services people are getting. The problem is that the GDP and the NHE are based on current dollar values for goods and services. Everything is valued at its price. If prices go up, the GDP can go up, even with no increase in actual production. The distinction I am making is between "nominal" and "real" GDP. "Real" GDP is how much is produced with price changes taken out. For example, if a medication you buy every month cost $30 per bottle last year and $33 today, you are spending 10% more now, but you are not getting more pills. You can fix this in your statistics if you value the bottles at one year's prices. That is done with a price index. This chart shows how the GDP has changed and how prices have changed. The difference between the upper line and the lower line is what's called real GDP growth. It is the growth in actual production of goods in services. On this graph, where the purple line is well above the red line, there was a lot of real growth during that year. When the two lines are close, all of the growth is in prices, not in real stuff. Real production shrank during the years for which the red square is above the purple diamond. From 1973 to 1981, prices rose fast, especially in the oil crisis years. You can see how high the red line was during those years. Nearly all of the high growth of nominal GDP during those years was because prices were rising, not because actual economic activity was rising. For the 1960s, 1992-2000, and 2003-2005, the purple line is well below the red line. There was real economic growth during those years. For 1974, 1975, 1980, 1982, 1991, 2008, and 2009, the red line is above the purple line. This means that real production fell during those years. Those were recession years. 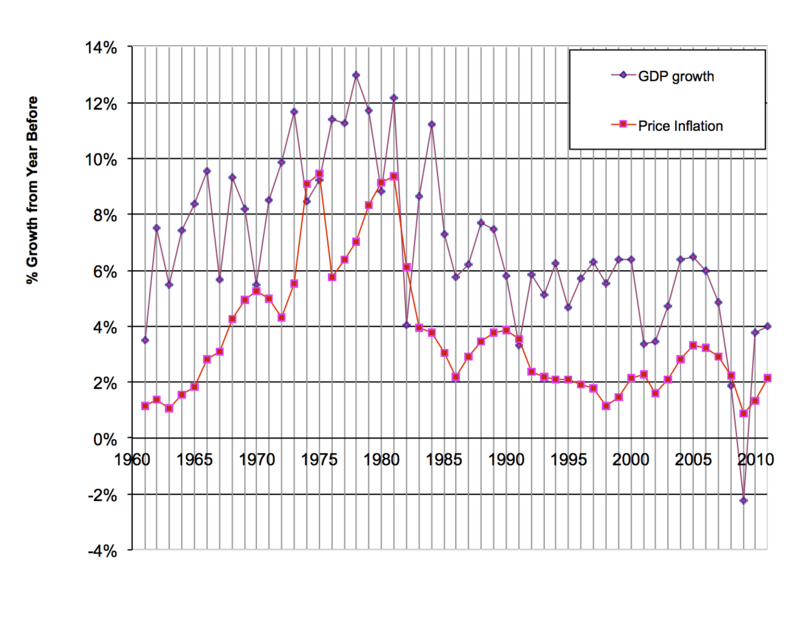 To get the growth rate graph for real GDP, subtract the red price inflation line from the purple GDP line. This gives you the purple line in the graph below. This graph takes general price inflation out of the GDP, and also takes general inflation out of national health spending. The lower line shows the annual percentage change in real GDP. 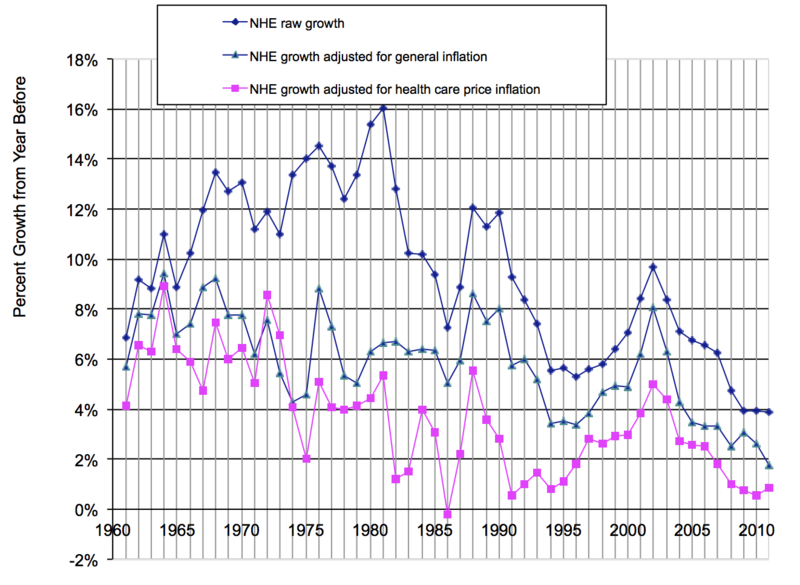 The upper line shows the annual percentage change in the national health expenditure from the year before, with rate of increase of prices in the whole economy subtracted out. In this graph, especially the left half of the graph, you see that real GDP growth has jumped up and down a lot. In other words, the growth rate of real GDP can change a lot from one year to the next. 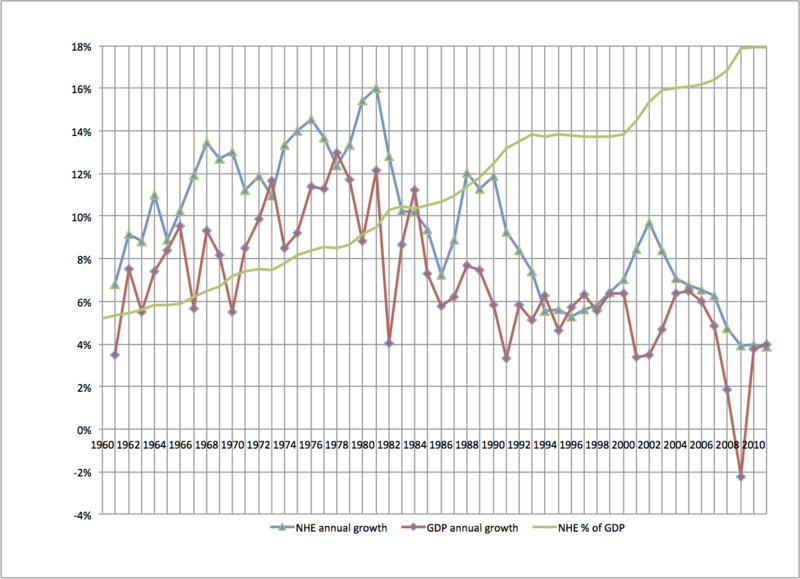 From 1992 to 2007, the fluctuations in GDP were not as great as they had been before. Then came 2008 and 2009, which were disasters. National health spending's growth has not fluctuated as much as GDP's growth. In the graph, notice that the blue line's peaks and valleys are not a big as the red line's. Economists say that health care is less "cyclical" than the whole economy. From 2008 to 2010, when the economy's growth rate took a dive and then came back up, health care's growth was very steady. Construction, by contrast, is a very cyclical industry. In 2008, when the housing bubble burst and the banking system froze, construction just about stopped. To get to "real" health care spending, you would want to adjust health care spending by health care price changes, not just general price changes. Health care has its own rate of price inflation that is higher than the general rate of inflation. The upper line shows, for each year, the percentage change medical care prices, compared with the year before. The lower line shows the percentage change in prices generally in the U.S. economy. The GDP price index and the medical care price index come are calculated by different agencies on different bases. The medical care price index comes from the U.S. Bureau of Labor Statistics. It is part of the consumer price index, based on the spending patterns of urban workers' families. It is not quite right to compare this with the price index for the whole economy that the U.S. Bureau of Economic Analysis calculates. That's because there are lots of things in the whole economy and in health care spending that urban consumers do not buy. For example, health care spending includes public health, and it includes construction and maintenance of buildings where medical care is delivered. Individual consumers do not buy those things. Take this comparison of price inflation as a rough guide only. In every year, except for the oil price shock of 1973-1974, medical care prices went up faster than prices in the economy as a whole. 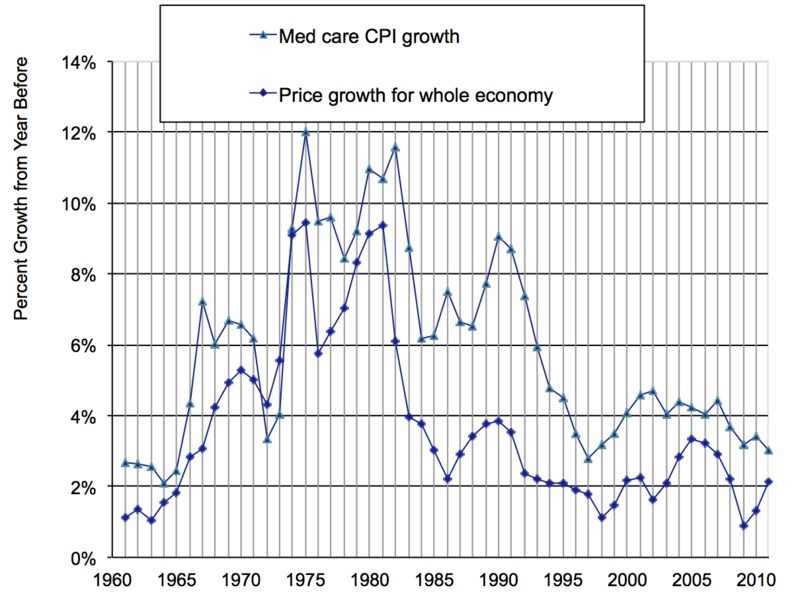 Medical care prices rose much faster than general prices during 1985 to 1992. In 2008, general inflation slowed. Medical care price increases also slowed, but not by as much. Based on that, we separate price changes from real changes in medical care goods and services. Again, this a rough estimate, for the reason mentioned above. 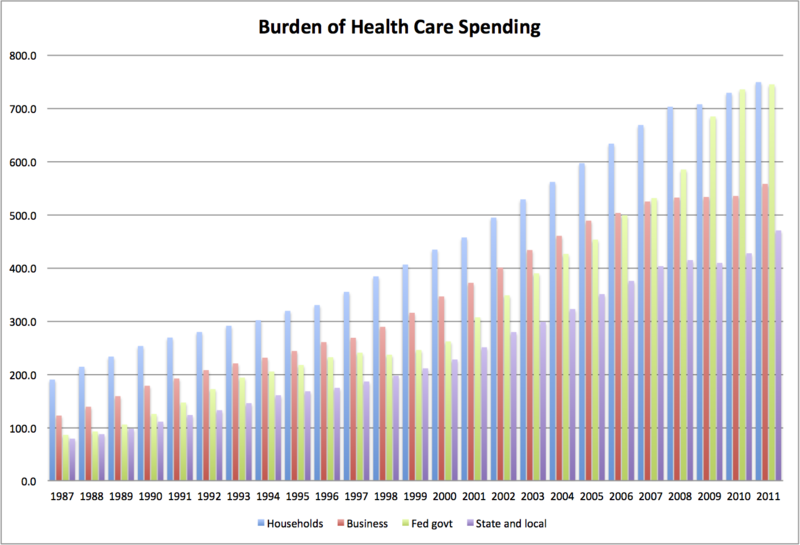 In this graph, the top line shows how nominal national health spending changed each year. The middle line shows how national health spending changed each year, with general price inflation in the economy is taken out. This is an indicator of how fast resources flowed into the health care sector. The pink lower line estimates the real growth rate in the health care sector. All price inflation is taken out. This is actual health care goods and services. The pink line, if you look from left to right along it, shows you that real health care services grew faster from 1960 to about 1980 than they have since. Real health care services grew some every year except 1986. Real health sector growth in 2008-2010 was low by historic standards, though there were some almost-as-low growth years for health care in the early 1990s. When there is a big difference between the blue line and the pink line, as during 1975-1981, most of the growth in health care spending is due to rising prices for medical care, not more actual service. 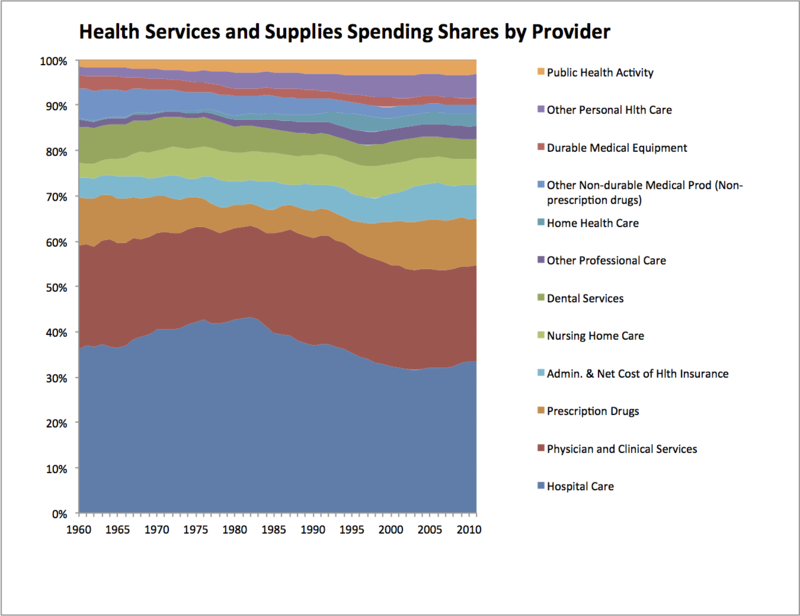 When the blue and pink lines are close, as during the early 1960s, most of the growth in health care spending is due to more service being provided. For 2011, the blue diamond is at about 4%. The green triangle is at about 2%, and the pink square is at about 1%. You can interpret that like this: Of the 4% that health care spending grew from 2010 to 2011, one percentage point was more actual services and goods, one percentage points was general price inflation, and 2 percentage points were health care price inflation in excess of general inflation. Now let's look at who spent all this health care money. This chart breaks down U.S. health care spending into three categories of spender: private, state and local government, and Federal government. 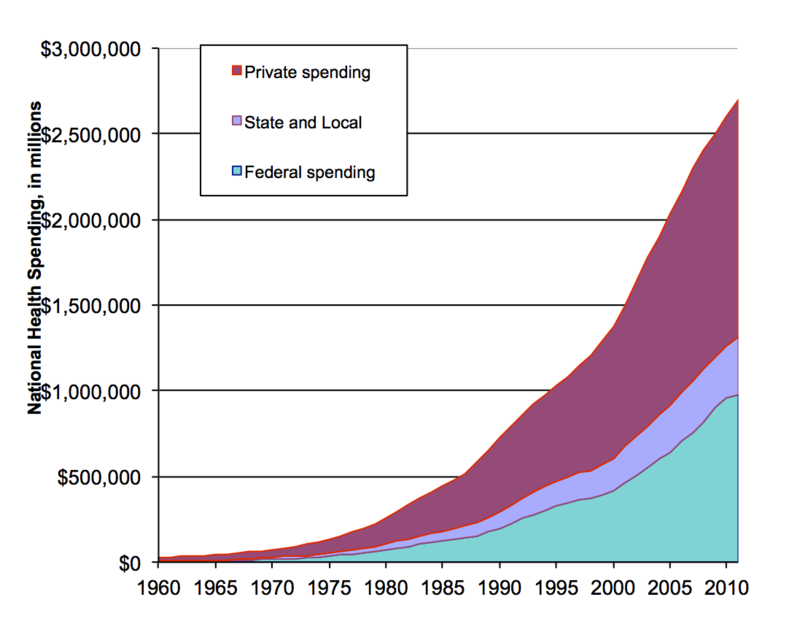 Federal spending is mostly Medicare and Medicaid. State spending is mostly Medicaid. Private spending is mostly out-of-pocket payments and private insurance. All three categories have gone up a lot over the last fifty years. Federal spending in 2011 was a little under $1 trillion. Total health spending was $2.7 trillion. This chart shows percentages. It shows how much of U.S. health care spending was private, how much was state and local government, and how much was by the Federal government. The Federal government share of health care spending grew over this whole period, from 8% in 1960 to 36% in 2011. There was a sharp jump in the Federal share after 1966, after Medicare and Medicaid started. After that, Federal spending's rose gradually after that, peaking at just over 30% in 1998. The Federal share fell a bit from 1998 to 2000, partly because of Medicare cuts, and partly because private spending grew as the economy grew briskly. Some liberalization of Medicare in 2001, and a slowing of private spending due to the poor economy, sent the Federal share back up during 2001 through 2005. The Federal share rose again in 2006, when the Medicare prescription drug program started. Federal funding for prescription drugs rose by $26 billion in that year. Private spending for prescription drugs fell by $2 billion from 2005 to 2006. From 2007 to 2010, the Federal share rose by about 3½ percentage points, as the private economy slumped. The Stimulus act of 2009 raised the percentage of Medicaid that the Federal government paid. The Federal share bumped up. That expired in 2011, so the Federal share went down and the state government share went up. State and local spending (the middle band) includes the state portion of Medicaid and CHIP (Medicaid extension for children), as well as state and local public health activities. State and local government spending's share is a lower now than it was in 1960. It was nearly 14% in 1960. It was just 12.3% in 2011. South Carolina is an example of what happened. Back in the 1960's, South Carolina paid for Department of Health and Environmental Control services with state dollars. Much of that is now paid for my Medicaid, which is about three-fourths Federal money. The states' share of health care spending was lower in 2009 than in past years. States have cut back spending as their tax revenues have fallen during the recession. As mentioned above, the stimulus act (properly called the American Recovery and Reinvestment Act of 2009) increased Federal government's share of Medicaid costs in 2009 and 2010. Public spending was 49% of all health spending in 2011, according to the chart above. The actual role of government in paying for health care is bigger than that, because of other two big flows of Federal government spending to health care. One is the tax subsidy for private health insurance and health spending. Our tax law allows businesses and individuals to deduct health insurance and some health care spending from their taxable incomes, and thus pay less income tax. In effect, the government pays back individuals and businesses who buy health care. The other flow of money is what governments pay for private health insurance, like FepBlue, for public employees. That counts in these chart as private, because the insurance company is paying the providers. If you move those categories from private to public, the public share of health care spending is about 60%. 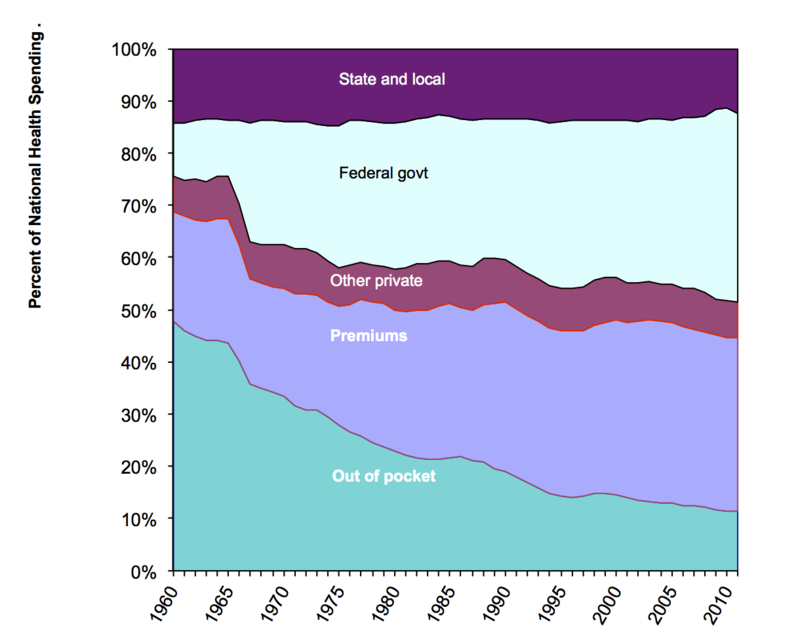 This graph separates the private share into out-of-pocket payment, payments by private insurance, and other. I reversed the vertical order of the sections, so you can better see how the private share divides. Over the decades, a smaller and smaller share of health spending has been out-of-pocket. Out-of-pocket spending's share declined from nearly half of health spending in 1960 to just over one dollar in nine in 2011. Deductibles and copayments are getting higher, which means more out-of-pocket spending, but public spending has growing faster. Insurance premiums as a proportion of health care spending has been falling gradually since 2003, down to 33% in 2011. 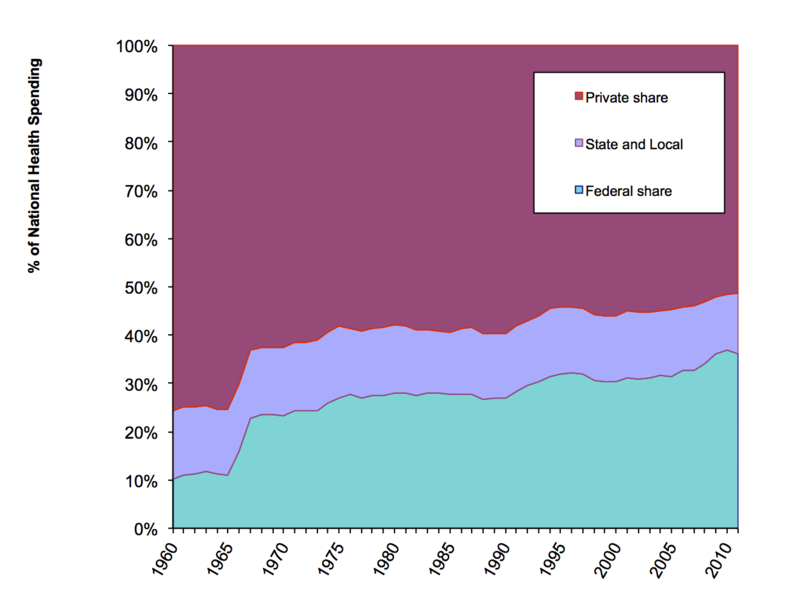 The Federal share jumped in the 1960s when Medicare and Medicaid started. The Federal share has continued to grow. This is partly due to the aging of the population. More Americans are old enough for Medicare than ever before. Mostly, though, it is due to expanded coverage by Federal programs, especially Medicare and Medicaid. Some politicians like to claim that philanthropy can replace government health care programs. You should know that philanthropy is less than half of that narrow marroon band in the middle of the chart labelled Other Private. Most of the Other Private money -- more than philanthropy -- is what hospitals make from parking fees, the gift shop, and the cafeteria. Philanthropy, by the way, means money donations. The value of volunteer work is not included at all in national health expenditure, or in the GDP, for that matter. The GDP only includes money flows that pay for goods and services. Notice that there is no category here for uncompensated care. That is also because only money flows count here. The money that providers get from government to help them cover uncompensated care is part of public spending. Money that providers get for uncompensated care by higher charges to insured patients is here, as well. It's part of private spending. Health care spending by "sponsor"
The Federal CMS has a separate calculation of who bears the burden for how much of health care spending. CMS defines three categories of "sponsors": Businesses, households, and governments. Business spending includes employer-paid private health insurance premiums, the employer's Medicare tax, workers compensation and temporary disability insurance, and worksite health care. Household (people) spending includes health insurance premiums, Medicare taxes and payments, and out-of-pocket spending. Government spending includes Federal, state, and local government private health insurance premiums, the Medicare tax (they pay it, too), Medicare spending from general revenue, Medicaid, and other programs like public health and the Veterans Health Administration. This chart shows the amounts. CMS has done this calculation going back only to 1987. The numbers on the vertical axis are billions of dollars. The Federal government's burden is the fastest growing since 1987. The Federal government -- which means Federal taxes (other than the Medicare tax) plus what it borrows -- passed business in 2007, and is now just about as big as households. The burden on state and local governments has grown a lot, too. From under $100 billion in 1987, it grew to about $450 billion by 2011. Here is a chart of the shares. The government share rose pretty steadily over this time period, from 32% in 1987 to 45% in 2011. All but two of the 13-point increase was Federal. The private share fell by 13 percentage points. Nine of those was the fall in the household share. If we want to use these numbers to estimate the role of government in paying for health care, we would move some of categories from private to public. In particular, for 2011, we would move to the government tally $169 billion in employee Medicare taxes and individual Medicare premiums, and $84 billion in employer Medicare taxes. That would bring the government total to $1,467 billion. This would be 54% of all health care spending in 2011. Add in the value of the tax deduction for health insurance and health car bills, about $200 billion, and the government's share goes to 60%. In short, much of health care spending in the U.S. is private, but most of it is government at some level. This shows the amounts spent, in billions of dollars, on each major category of health services and supplies. Hospital care spending in 2011 was about $850 billion dollars. It's the biggest single category of health care spending. Physician services is second biggest, at over $500 billion. Pharmaceuticals is third biggest, at about $250 billion. Nursing home care, which was third biggest from about 1985 to 1995, is now fifth biggest. It was overtaken by pharmaceuticals and administrative cost for insurance. Toward the bottom is Research. This includes research such as is done at our School and other such institutions. Research done by pharmacetical companies is paid for by their sales of drugs, so it is included in the pharmaceutical spending category. Similarly, hospitals' and doctors' offices' administrative costs are in the hospitals and physicians lines respectively. The Administration line is only what it costs the insurers to run their programs. This shows the same data with a logarithmic Y axis. Straight lines on a logarithmic graph are constant growth rates. Steeper slopes mean higher growth rates. This graph also helps you see what is going on in the earlier years with some of the smaller components of the health care system. Hospital care's fastest growth was before 1983. (Notice how hospital care's line is less steeply sloped after 1983 than before.) 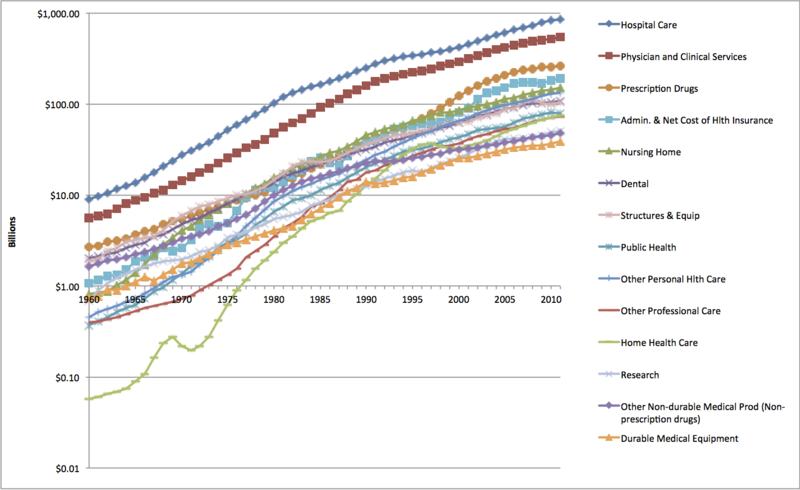 Physician services growth peaked later, around 1992. Pharmaceuticals' growth picked up around 1996. Growth didn't stop, or turn negative. These sectors kept growing, but by a smaller percentage. Their growth rates picked up around 2000. Nursing home growth was rapid in the 1960s and 1970s. After that, growth slowed. Home health grew fast from a small start, but its growth rate slowed in the mid-1990s. The bumps and dips in home health spending show how much this industry was affected by government policy changes. 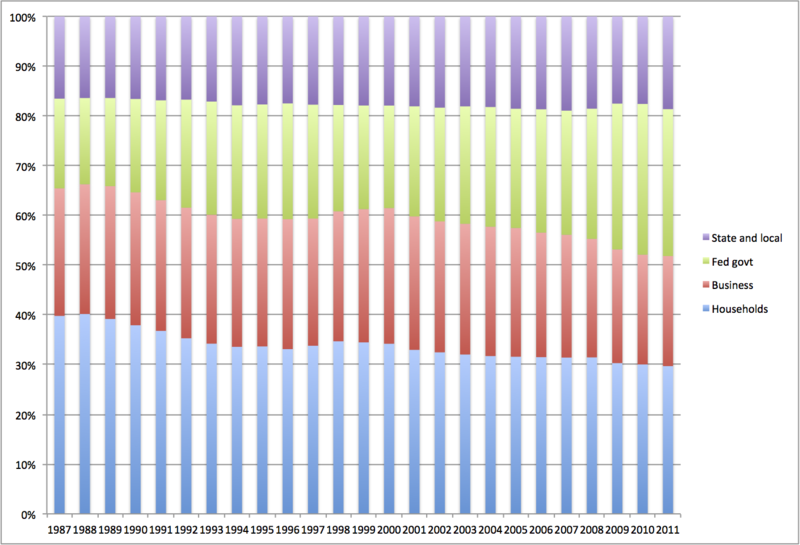 This graph shows, for the years 1960-2011, relative shares of the health health services and supplies dollar. That is everything in the preceding graphs except research and construction. I put public health at the top of the graph. That lets you see how public health's small share rose from 1960 to 2000, then levelled off pretty much. Administrative cost's share rose from 2000 to 2007, but fell in 2008 and 2009. Nursing home care grew rapidly in earlier years, but recently other sectors have grown faster. Home health care's has grown. Prescription drugs got left behind a bit in the 1960's and 1970's, but have since more than come back. Physicians generally maintained their share. 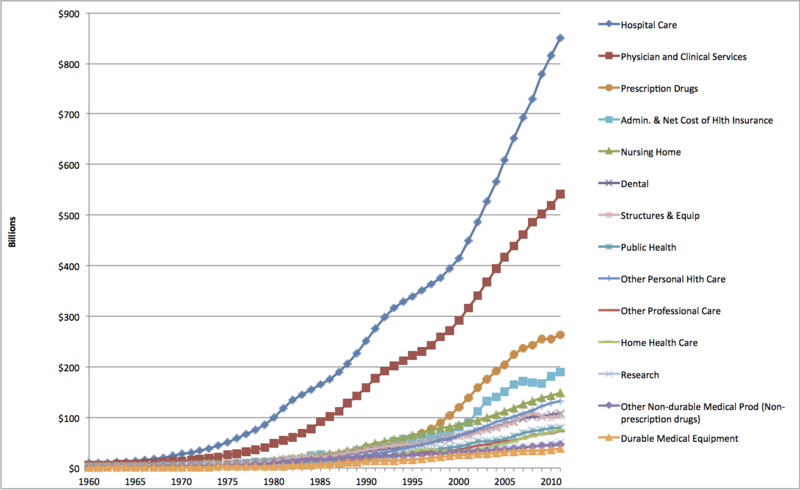 Hospitals' share rose from 1960 to 1983. From 1983 to 2001, hospitals' share fell. This does not mean hospitals were getting less money. The preceding graph shows that hospital care was growing, by a lot. It just means that other parts of health care grew faster, from 1983 to 2002. Since 2003, the hospitals' share has been creeping up. That is your general overview of U.S. healthcare spending. The most in the world! But do we get good value for all that spending? That's what a lot of this course is about!